Tonight I’m sticking with Mini-Busts but moving from DC to Marvel, and looking at the Bowen Designs Nova Modern Mini-Bust. For collectors of Bowen’s Mini-Busts, the pickings have been slim in recent times as Bowen have dealt with some issues with factories producing the bust line. 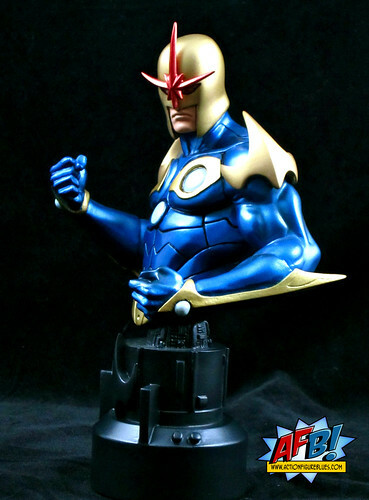 The Modern Nova Bust is a recent light in the mini-bust darkness sculpted by none other than the ridiculously talented Kucharek Brothers. I recently bought the Bowen Nova Classic Statue, so wanting the modern look as well would mean breaking my one piece per character rule. I justified this bending of the collecting boundaries by the fact that Nova in his modern look was briefly a Secret Avenger, and I collect all Avengers, and yes I know that’s a very thin thread to dangle from, but the idea of having collecting boundaries makes me feel better anyway. Of course, once I knew that the Kucharek Brothers were on sculpting duties, the purchase was a lock! I am a big fan of the modern version of Nova’s costume. 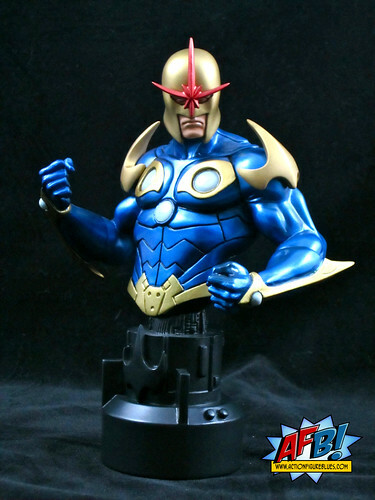 It’s a modern twist with more angular lines and exaggerated features that remains faithful to Nova’s classic look but takes it to the next level, and adds a majestic edge to his cosmic exploits. The Kucharek Brothers have very faithfully brought it to life through their excellent sculpt. One of the things that the Kucharek’s consistently bring to their pieces is a sense of depth and density. Many sculptors could fulfil the brief of presenting a likeness of a character, but the Kuchareks do it with such an amazing amount of detail that you almost expect to be able to see the character breathing. Nova’s armor has been sculpted with such a level of detail that you really get the sense that there is a man underneath it. The features such as the angular shoulder pads and forearm accents are beautifully done. The red burst on Nova’s helmet is rather prominent, but a check of the reference art shows that this is a comic accurate representation. The shape of Nova’s helmet is another aspect of this piece that shows such a strong understanding of Nova’s appearance in the comics. This is truly one of those pieces that feels like it’s jumped right off the pages of the comics. The base of this bust was shown in the design phase with some gold accents which matched the accents on his uniform. I’m glad these were abandoned in the final version - there’s enough happening visually here, and the understated base helps draw attention to the main event - Nova himself. Bowen pieces have a much better strike rate with paint quality than other companies, and this piece won’t be doing anything to blot that record. The work with the metallic colours is excellent, and the matte pieces like the red burst on his helmet become accents against the overall metallic tone. I particularly like the way that the white sections, which light up in the comics, have a different appearance to them, as through they are opaque glass. A great touch. 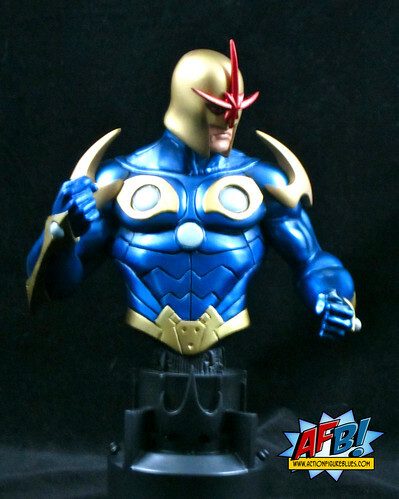 Bowen bust collectors should be well pleased with this great release, and Nova fans even more so. It’s definitely looking great on my shelves! Now that is all sorts of cool! Man when did Nova get all sorts of "Edgey"?